When it comes to investing, I am not particularly interested in owning the kinds of companies that will be growing the fastest in good times. Rather, I am interested in owning the kinds of companies that will still be churning out profits without much of a hitch in an environment similar to The Great Recession economy of 2008-2009. That kind of attitude is something I picked up from my dad when I was little. Anytime we would watch the postgame conference of the athletes after a sporting event, my dad would point out the athletes that handled defeat the most gracefully and often hold them up as inspirational figures. After all, anyone can look good after winning a national championship, but it takes a special kind of person to look good after losing a national championship. 1. Failure is simply the opportunity to begin again, this time more intelligently. 2. The only real mistake is the one from which we learn nothing. 3. What is life, but attempting to triumph after failure, anyway? 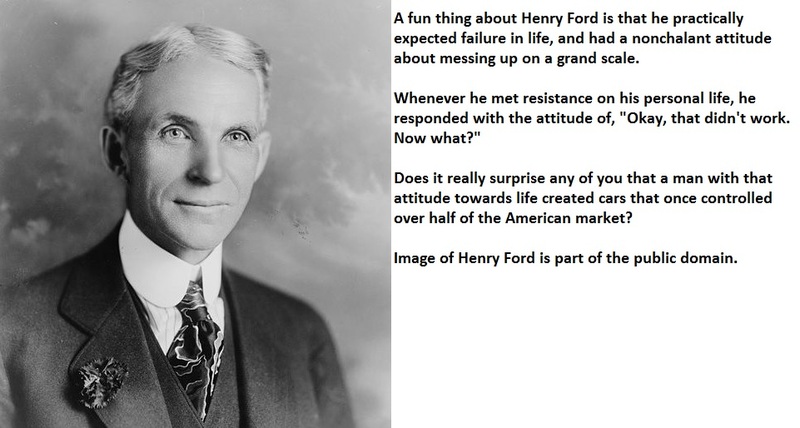 What I like about Ford is that he regards failure as part of the full cycle of life. A lot of people treat failure and disappointment as something to shoo away, quickly forget, and never speak of again. Ford treated it as an important learning opportunity. Most importantly, he was cavaliar about screwing up. He didn’t have a “Woe is me! The world is ending!” kind of attitude when things went wrong. Rather, his point of view was basically, “Okay, that didn’t work, what next?” I find Ford’s philosophizing about failure refreshing.